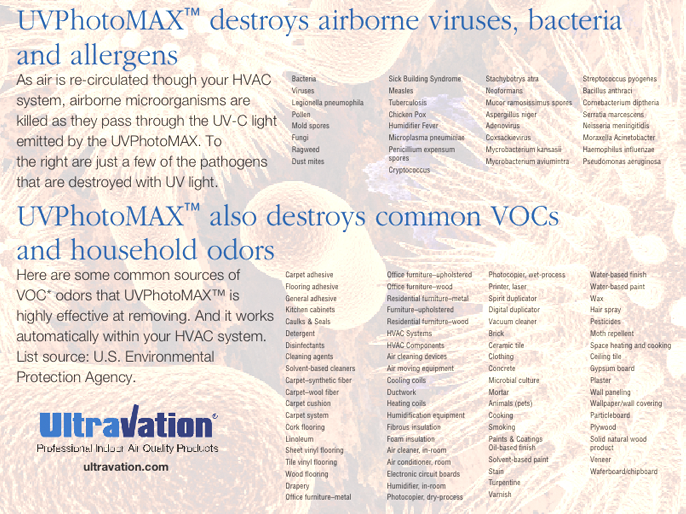 UVPhotoMAX™ uses the power of TWO-bands of UV light and Ultravation’s ReFresh™ high performance photocatalytic advanced oxidation process to destroy millions of bacteria, viruses, allergens while neutralizing hundreds of common household odors. ReFresh™ patented Advanced Oxidation System eliminates hundreds of common household odors. The ReFresh™ purification process is a system we developed for commercial applications and patented in 2004*. Utilizing a proprietary formula, the Ultravation® ReFresh™ air purifying process brings the science of nanotechnology into indoor air quality improvement. Titanium Dioxide (TiO2) is used to promote an ionic discharge from the UVPhotoMAX™ metal oxidation chamber. The advanced oxidation process is powered by our specially designed two-band UV lamp and controlled by our patented*** Photon Clarifier™ an Ultravation exclusive! The exact amount of treatment is adjustable based on living space, temperature, humidity, and other factors. This high efficiency germicidal system produces plasma wavelength energy in the key bandwidths of 185 nanometer (NM) and 254NM. It operates on a molecular scale, creating an oxidation process that quickly reduces or eliminates even the most stubborn odors, as well as killing millions of airborne pathogens including common viral flu strains, bacteria and mold spores.